From feature stories to listicles—you will know the truth, and the truth will set you free. Everyone has retweeted the commemorative infographics and seen the logo and stuff in the programs and stuff all year, but Nov. 30 was the actual anniversary: 75 years—football has been played in Jordan-Hare Stadium for 75 years. 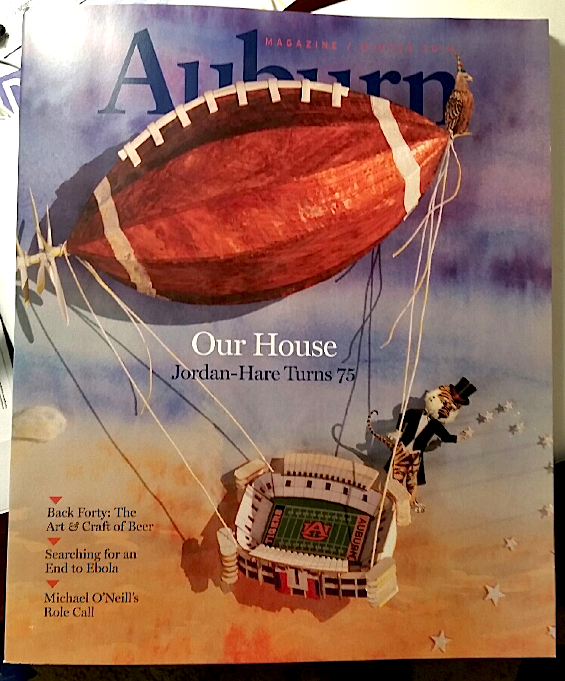 I wrote a story on the stadium’s history for the Winter 2015 issue of Auburn Magazine, trying to weave all manner of trivia about how and why it got here into this tapestry of pigskin profundity. I had 3,000 words to do it. When I looked at the word count for the first time, I was, like, pushing 5,000, and not even halfway there. I was barely even past the first game. And it’s because I was discovering all these amazing, unexplored galaxies of details surrounding the stadium’s original dedication in 1939. Stuff you never, ever hear about or read about. Which is a shame, because it’s the kind of stuff that can sharpen our focus on important parts of Auburn’s football history, which, as we have learned through bitter experience, in certain areas (like the un-trivial correct original capacity of Auburn Stadium) is almost farcically fuzzy. 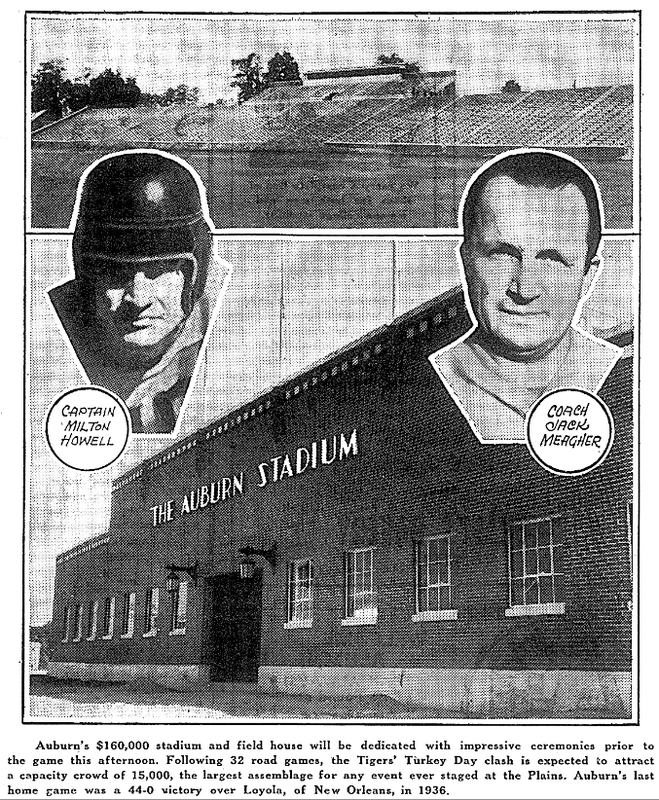 The stadium’s original capacity was twice as much as everyone says it was. The university, the athletic department, Google Book previews of dozens of random football histories—everyone copy ‘n’ pastes the original number of seats as around 7,500. Which would probably come as a shock to the 11,000 to 13,000 people in attendance at the first game, all of whom had nice, new comfy seats. You can read more about the discrepancy here. John 8:32. One hundred Bama fans had block seating on the 50-yard line. Yes, some of The Forgotten—and you may want to still forget about them—were Bama fans, around 100 of them. And I’m not talking, like, those random weirdos who somehow stumble into a ticket and slowly walk around the railing in a Bama shirt as some sick attention shtick. These were actual University of Alabama graduates, mostly from Montgomery, who had been encouraged by the Montgomery Chapter of the Alabama Alumni Society to buy the fancy, construction cost-defraying souvenir tickets for the Auburn-Florida game as a gesture of state solidarity. Steps were taken to make them feel very much at home, even down to the disgusting song they heard at halftime. Read more about this perplexing pigskin irony here (and shudder). Auburn didn’t win the first game played in Jordan-Hare. But they totally should have. Think the crap call that cost Auburn a win over Texas A&M in 2014 was bad? Imagine being second and goal and thinking you have two whole minutes to punch the ball in for the go-ahead touchdown in the first game in the new stadium you’ve waited decades for only to be told, no, you had two seconds, game over. The ridiculous officiating that kept the first game in Auburn Stadium a 7-7 tie was front and center in newspaper coverage of the game across the country. You can find details of how it all went down here. Tell your grandkids. Auburn technically did win the first game played in Jordan-Hare Stadium. Because even though it was played only by freshmen, who weren’t allowed on varsity squads back in the day, Auburn’s 10-0 shutout vs. the Georgia Tech Baby Jackets on Nov. 10, nearly three whole weeks before the stadium was dedicated, was technically a game of a football. No one remembers it. They remember the Florida game, the dedication game. But the freshman game vs. Georgia Tech was a momentous enough occasion for Auburn publicity man Elmer Salter to deem it a christening. The Plainsman headline actually referred to it as a dedication. More super-important stuff: The game was umpired by Boozer Pitts, former (for a couple of years) Auburn head coach, and a star under Auburn legend Mike Donahue. The ref was another Auburn guy. But the head linesman and field judge were both former Bama players. But not even they could stop freshman phenom Monk Gafford that day. Gafford was a future All-American and supposedly was the greatest back General George S. Patton had ever seen. Ol’ Monk from Fort Deposit lobbed a 21-yard pass to 170-pound Fred Hurst from Birmingham in the first quarter (still love you, Babe) for the first normal American football touchdown scored in Auburn Stadium. Monk was eventually inducted into the Alabama Sports Hall of Fame. Seems like Fred signed a baseball contract with the Washington Senators before his senior year. The second and final score of the game was Jack Smith’s 29-yard Auburn field goal in the second quarter. Georgia Tech didn’t make it past midfield for the entire first half. Probably because they didn’t get a first down. They were better in the second half. Just not better enough. The first game in Auburn Stadium was almost delayed a year… because of a Presidential executive order. Yep, if FDR had gotten his way, there wouldn’t have even been a first game, not in 1939 anyway. If FDR had gotten his way, I’d be writing this in 2015. But he didn’t, not in Alabama at least. Nope, the hearts of Dixie were set on celebrating Thanksgiving Day on Nov. 30, like it was supposed to be, not Nov. 23, national economic woes be damned. “Franksgiving” was off. The game—which was specifically scheduled to be played on Thanksgiving Day, for crying out loud, was on. Related: The Almost Names of Jordan-Hare Stadium.